Sunglass Hut Sale is now on across all sunglasses! The iconic logo of Sunglass Hut will be familiar to any traveller - who hasn't spent an hour here and there trying on sunglasses at one of the many Sunglass Hut stores in airports across the world? Since it was founded in Miami in 1971, Sunglass Hut has truly gone global, with thousands of stores all over the world today. The firm offers probably the best selection of sunglasses on the high street, with brands such as Oakley, Ray-Ban, Prada and Versace. Whether you are looking for a set of classic aviators, or fashionably oversized designer goggles, Sunglass Hut is a one-stop shop. Add Sunglass Hut to your Favourites list and be the first to know every time they have a Sale on! 1st January 2018 - Sunglass Hut New Years Day sales for 2018. 7th May 2018 - Sunglass Hut Early May Bank Holiday sales for 2018, add to your diary now! July 2018 - Sunglass Hut Summer 2018 sales, joining us? 23rd November 2018 - Sunglass Hut Black Friday sales in 2018 start on Friday 24th November. Add products from Sunglass Hut to your Love Sales list. Get the Love Sales button now! 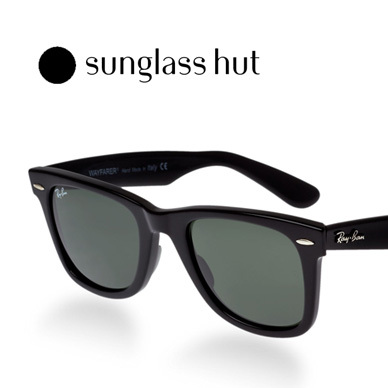 Sunglass Hut January Sale is now on across all sunglasses! Enjoy up to 40% off in the Sunglass Hut January sale! Get those sunglasses ready for the summer! Sunglass Hut Black Friday sale is now on with 20% off all brands! Get in quick ready for those sun holidays!